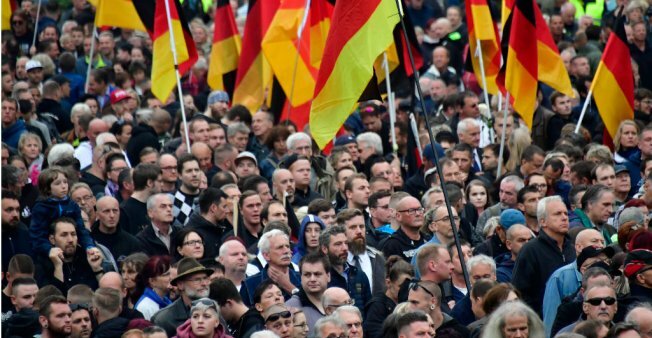 On Saturday, 8,000 people answered a joint call by far-right party AfD and Islamophobic PEGIDA street movement to descend once again on the streets of the former communist city which was in erstwhile East Germany. The mobilization vastly outnumbered a contingent of 3,000 counter-protesters, including Green party and Social Democratic Party MPs, who had also converged to take a stand against racism. Police are also examining at least 37 possible offenses, including bodily harm, property damage and resistance against law enforcement officers. A television crew from regional broadcaster MDR said they were also assaulted they were while filming scenes of a protest from an apartment building. Away from Chemnitz city center, a 20-year-old Afghan man suffered light injuries after he was assaulted by four masked men. Police said they were investigating if the perpetrators counted among demonstrators. Scenes of men chasing down foreigners in Chemnitz and chanting “foreigners out” have rattled the country. On Sunday, two smaller demonstrations against xenophobia passed without disturbances. Another major event is expected on Monday when German punk band Die Toten Hosen leads a free concert against racism. “The silent majority must get louder,” he said. The far-right AfD party has won strong support in the region through its campaign against migrant arrivals, and surveys suggest that it is poised to become Saxony’s second biggest party in next year’s regional elections.